The NMSU Fire Department (FD) provides emergency response for the NMSU main campus. NMSU FD also responds mutual aid to other departments in Dona Ana County and to the City of Las Cruces. 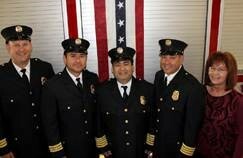 Our Fire Department is staffed by four career administrators, two career firefighters and fourteen student firefighters. The firefighters are full-time students at NMSU or DACC; see our employment student firefighter web page for additional information about our program at NMSU. NMSU earns new Insurance Service Office (ISO) Public Protection Classification of 2/2X. The new rating takes effect on July 1, 2018. This new rating ranks NMSU’s Fire Department in the top 3% of all Fire Departments in the United States. Check out our press release. NMSU Fire Department is a full service fire department. 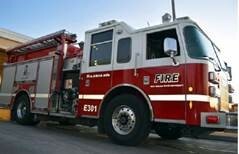 We provide fire suppression, emergency medical services, hazardous material response, and technical rescue response. In addition, we perform medical standbys for all athletic games, special events, and concerts. NMSU FD also provides fire prevention, other public education services, and programs. NMSU FD is centrally located at the corner of Wells St. and Research Ave., south of the intramural fields. Here is our location.